Political Awareness falls under the category of emotional intelligence (EI). As a leader, the higher up the ranks of an organization you progress, the bigger the range of stakeholders you will need to work with. Each of these stakeholders may have different goals, priorities, agendas, and personal style to your own. They may even have hidden agendas – ulterior motives that they are not willing or able to share with you. Political awareness is the ability to understand different people’s hidden agendas and use this knowledge to your advantage. Essentially, by understanding the lay of the green you can influence more effectively and with more sensitivity to different viewpoints. Many people see politics as something underhand, devious, and sneaky. This is increasingly becoming an old-fashioned view. Political awareness should be viewed as an important element of leadership and used well it can be used to get things done. No leader who wants to get things done can afford to turn a blind eye to the political dimensions that exist in their organization. An extension of political awareness is organizational politics. Organizational politics may sound complex but it just means the power relationships that exist when any group of people come together. Organizational politics is a natural part of life, and of life within an organization. When we think of organizational or office politics we often think of someone with a big ego arguing their opponents into submission, however, people who quietly succeed in their careers are not unpolitical, they just do it better. Organizational politics is not about the organization chart, it’s about how things really get done, who holds the real power to make decisions, and who are the key people that these decision makers listen to and take guidance from. It is important to understand office politics not just in terms of getting things done but also in terms of your own career advancement. Harvey Coleman in his book, “Empowering Yourself”, asserts that how well you do in your job has little to do with how well you will do in your career. He asserts that your career performance is based on a combination of Performance, Image, and Exposure (PIE). Performance (10%): this is the day-to-day results you deliver. Image (30%): this is what other people think about you. It is your personal brand. Are you perceived as someone who brings a positive attitude and gets things done, or are you perceived as a negative influence on any team or project? Exposure (60%): This is who knows about what you do. Does your boss know? Does their boss know? Are you known outside of the organization within your industry? Coleman estimates (I’ll leave it to you as to whether you believe the ratios are accurate) that the factors that influence your success are 10% performance, 30% image, and 60% exposure. If you’re looking to get ahead in your career, then you might like to check out Coleman’s book, Empower Yourself on Amazon. This is the skill an individual has at reading the organization around them. Where are the power bases? What are the covert agendas? What is the culture of the organization? How much influence does the individual wield within the organization? Reading essentially means having the awareness to turn outwards and understand context. The two ends of this dimension are ‘Politically Aware’ and ‘Politically Unaware’. This is the skill of managing what’s being carried into the situation, meaning it’s about what the individual brings to the situation, with their internal understanding of the situation and what they intend to do. Carrying runs on a scale from “acting with integrity” to “playing psychological games”. People with excellent political skills not only understand the need to turn outward and read the situation, they also have the skills to do so. It is important to note that they model isn’t designed to define individuals. The model is flexible, meaning we have the ability to use different behaviors at different times. This is because our ability to read and carry is in constant flux as the organization and our power position within it constantly change. Use the model regularly and quickly check where you are right now on a particular topic or issue. You can obviously also use it to attempt to understand others. Note that the two states on the left of the model are associated with selfish behavior whereas those on the right are associated with organizationally focussed behavior. Let’s examine each of the behaviors in turn. The Sheep approach is built on a foundation of implied innocence. Sheep are suspicious of politics and want everything to work out well for all concerned. They are often oblivious to office politics and because of this will struggle to get anything done. They believe that the best idea or solution will always be selected and that only formal channels of process and persuasion exist. Sheep tend to be poor networkers, and often listen to what others are saying but don’t hear the real message. Similar to sheep, the donkey is politically inept, but they lack the integrity of the sheep. Donkeys are determined to get what they want, but because they aren’t politically astute they will ignore the established political power bases when trying to achieve something. This often means they have a reputation for “putting their foot in it.” I’m sure we’ve all met people who think they’re very political, perhaps mentioning who they know or their inside knowledge. Sadly, this is just illusion and the donkey’s beliefs leave him both lacking in team support and vulnerable to be taken advantage of by someone more astute or ruthless. Donkeys are the kind of people who hate to be ignored and like to feel important. They will often make judgments based on how they feel rather than understanding the organizational context. They are not good at making strong coalitions. Foxes are politically astute but they use this intelligence for their own personal gain. They are good at forming coalitions and winning support for their ideas. Maybe you recognize this behavior from your career experience? Someone who will put their project first, even if it means jeopardizing everyone else’s project and the bigger objectives of the organization. Foxes tend to change job before their mistakes are discovered. They are excellent at manipulating situations so that they are never at fault. They are unprincipled, but excellent at exploiting a weakness in others to get what they want. The owl understands the politics of the organization, but their ethics make them use this political awareness for the benefit of the organization and themselves. Owls are excellent listeners and are aware of other people’s viewpoints, however, they are not afraid of being disliked if necessary. They are excellent at building support and forming strong coalitions. Owls like to create win-win scenarios. Unlike the fox, they are not afraid to share their emotions. They are overt and willing to openly share information where appropriate. They are guided by both ethics and doing what is right for the organization. Owls are dynamic and able to balance managing their profile, image, and exposure, with the ability to gain the trust and support of others. Owl like behavior is obviously the quadrant you want to frequent as a leader. Use the tool above to check where you are on an issue by issue basis. Here, we want to unite what is important to us and what is important to the organization and align our politicking with those goals. First, write down your top three priorities for the organization. Now write down your top three career priorities. Finally, write down what you spend most of your time doing or stressing about. Do they align? If not, they maybe you are helping someone else achieve their goals. If your goals and the organizational goals do align, the next step is to think about who needs to be aware of your achievements and progress? It can be easy to think that you just need to put your head down and work hard. Don’t be a sheep! Remember that exposure and image play a huge part in getting ahead. Successful politics revolve around communication and networking. If you build a good relationship and help someone out it’s likely they’ll return the favor when you need it. Likewise, if you block or obstruct them it’s likely they’ll return that favor too. When building your network of allies, look to build allies above your level, at your level, below your level, and even outside of your organization. Are you neglecting any of these groups currently? If so, make a plan to rectify this. The payoff for this regular effort to build and maintain your network may take years to bear fruit, but once you’ve built the relationships, little effort is required to maintain them. Finally, think about how you can bring onboard stakeholders with whom you have a history of poor collaboration. Can you at least think of a way to establish a good professional respect even if you’re never going to be best friends? Who holds the power? Who holds little formal power but has lots of authority? Who has the ear of the person with the authority? Who is being promoted and who is being ignored? What do people in power like and dislike? Observing and trying to answer these questions can not only help you identify who could make a strong ally, but it also helps you determine the organizational culture. If forthright people are holding the power and forthright people are also getting promoted, they perhaps you should consider adapting your style if it doesn’t already fit this mold. Likewise, if you observe that presentations starting with the big picture before moving to the figures are always better received than when the key figures come first, then think about changing your presentation style if it is not already aligned. In every organization, you’re going to encounter gossip. This is especially true when you’re aware of the need to build and maintain your network. Don’t get sucked into other people’s gossip. If someone is frustrated about someone else then frame your answer around them and their frustration, and how you understand their frustration, but don’t ever criticize others via a peer. Rather than saying, “He was a carpenter.”, we might say “A saw hung from his belt and wood dust filled the air.”. If you’ve had a success and achieved an outcome, don’t tell people about it, instead offer to repeat that success for another department or client. They’re learning about you’re a success but you’re not bragging, you’re offering to help them. If you do want to tell someone about a success use “we” and not “me”. Everyone will still see it as your success but you don’t look like you’re bragging and you still maintain the trust and loyalty of your team and coworkers. Let others spread the word for you. In a gossip situation let people know how well your project is going and how much you love doing what you’re doing. You’ll often find that they will spread the word for you. To get things done within an organization you will need to develop your political awareness and political skills. Within the context of an organization, political awareness means understanding the different inter-group power dynamics that exist between people. Because politics exists whenever groups of people come together, organizational politics is a natural fact of life, and it is important to develop your political awareness skills. The Political Skills Model is a useful tool in helping you understand where both you and others are on a particular issue.Political skills are not innate and can be developed with practice. 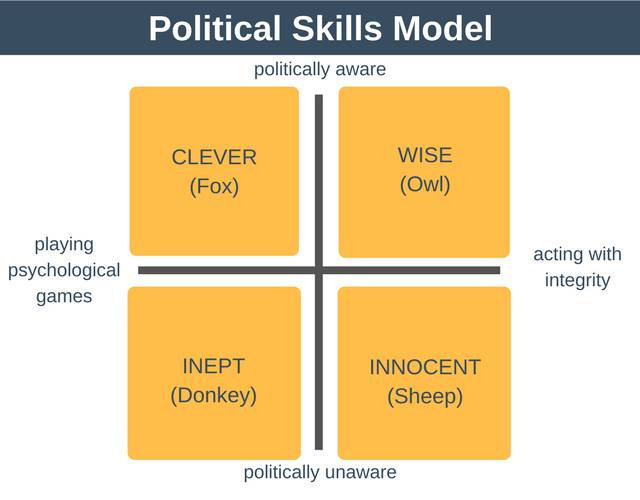 By using a combination of the Political Skills Model and the tips above, you can quickly improve your political awareness and political skills.